Hatters boss Nathan Jones has hit back at ‘foolish’ claims that his side are only where they are this term because of the club’s budget. 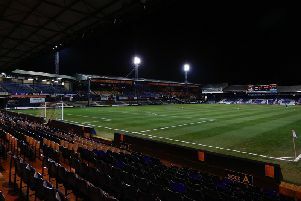 After Luton saw off Carlisle United 3-0 recently, a result that saw Town move back to the top of League Two once more, Cumbrians boss Keith Curle said: “They’ve got financial clout, as some of the other teams in the division have, and you’ve got to say it’s money well spent. We have a very competitive budget for this level, but it’s nowhere near the biggest. “They’ve invested well in strikers who find the net and they’ve got confidence in abundance from that. However, Jones didn’t think that was a fair reflection on what actually goes on a Kenilworth Road, as his response was: “It’s not the first one to comment on our budget and quite frankly they don’t know what it is. “I don’t comment on anyone else’s budget, but I’d be very interested to find out. “We’ve sold far more players than we’ve brought in, in terms of financially. “So, yes we’ve been able to bring some in, but we’ve also lost big players, so we’re well in credit. “We have a very competitive budget for this level, but it’s nowhere near the biggest, so that’s all I want to say. “At the end of the day, it doesn’t matter what kind of budget you have, you have to spend it wisely. “You have to train the players, you have to improve them, and what we do here is we improve every single player and they become bigger assets because they’re in our environment. “So yes, if big budgets guarantee you that then fine, but I don’t comment on anyone else and I’d appreciate it if no-one else did.